Rotarians from all over District 5280 enjoyed the Friday night RBRC Hospitality Night Table where Collette Paul, Nancy Campbell, President Karen & Jeff Weigel, David & Karen Whitehead, Rick & Helen Mendoza, Pat & Betty Cashin, Eli & Alice Gauna, Rolando Andrade, Laura Fields and Bart Thiltgen served wine, cheese, grilled veggies and fruit. Pope suspended for late payment of Rotary dues. This past weekend at the District Conference in Indian Wells, Michael McGovern from RI told the story of being in a conference with an Argentine Rotarian when the selection of Pope Francis was announced. Pope Francis to us, Fago to the Argentine Rotarian who noted that Fago was an honorary Rotarian in his club. Checking RI computer records Fago was listed as suspended for non-payment of dues. Oblivious to the honorary Rotarian rule in place at the time the local Argentine club had neglected to continue to pay his dues. This rule has now changed. 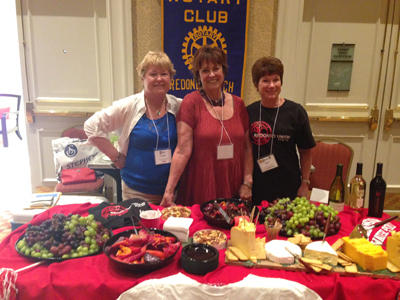 No more dues for Honorary Rotarians. Michael was only one part of a busy weekend reviewing area of service highlights, looking at grant successes and networking with clubs across the district. You could feel the Rotarian pride when a nine year old girl, from the front of the room talked about seeing the board in her classroom for the first time - thanks to the Rotary facilitated program to provide free glasses (Vision to Learn) – or to see the poise of the high school speech scholarship winner, the range of the vocal scholarship winner and the talent of the dance scholarship winner of the District 5280’s Art, Speech and Music Contest. Global Scholars and Exchange Students from around the world talked of their experiences. Conflict Resolution Rotarians, who recently returned from a conference in Istanbul talked of adding global perspectives to their efforts. Founders of S.P.Y. (Safe Place for Youth) talked about their challenges and directions and Rotarians brought sorted and packaged various supplies for the center. At the Governor’s Ball, Laura Fields husband Bart Thiltgen received a special Rotary International Award, the “Non-Rotarian Spouse Award” for all his service to Rotary. Congratulations Bart! On Sunday at the “Celebration of Life” breakfast, John Parsons, along with all district Rotarians that passed last year, was again recognized - an amazing compilation of accomplishments. Maybe the conference’s best part was the after midnight conversations, our feet in a cocktail bar fountain - or while wondering around a district wide tailgate party - or in between session hallway discussions. Rotary is so much more than our very active club. District conferences are one window into the scope of the world of Rotary. The next conference is May 16-18, 2015 at Loews Coronado Bay Hotel, San Diego. Mark your calendar now!